People on the pier wall during storm Ophelia on East Pier in Howth, Dublin, Ireland, as Hurricane Ophelia batters the UK and Ireland with gusts of up to 80mph. Three people have been confirmed dead in Ireland in incidents related to Storm Ophelia. Gardai said that a man died in Ravensdale, Dundalk after a car he was in was struck by a tree at around 2.45pm. General view of road closure at the Wooden Bridge to North Bull Island, Clontarf, Dublin, Ireland, as Hurricane Ophelia batters the UK and Ireland with gusts of up to 80mph. A recovery operation is currently under way in the area. In Cahir, Co Tipperary, a man in his 30s, was killed in a chainsaw accident when he was trying to clear a tree downed by the violent winds. Earlier, a woman died when a tree fell on to her car in severe winds. The Garda said the driver was in her mid 50s and was travelling outside Aglish village in Co Waterford when she was killed. A female passenger, in her 70s, was also injured and taken to Waterford Regional Hospital for treatment, gardai said. Her injuries are not believed to be life-threatening. Gardai have urged all road users to remain indoors and not to travel unless absolutely necessary. Gusts of over 96mph (156kph) have already battered the south west coast of Ireland. In Cork, the roof of Cork City's football stadium was blown off. Around 360,000 homes and businesses are now without power and trees and power lines have been blown over as the storm makes its way through the Republic of Ireland up into Northern Ireland. ESB, the Republic of Ireland's electricity network, warned that more outages are expected and that repairs will take several days. Ireland's National Emergency Coordination Group (NECG) on Severe Weather warned that the storm is "unprecedented with serious life- threatening conditions". The group added that all unnecessary travel should be avoided. "Do not be outside during the passing of the storm. The fatality in Waterford emphasises the dangers posed during this period," NECG added. In the Irish Republic, schools, nurseries and colleges have been closed, court sittings postponed, numerous hospital outpatient appointments cancelled and the Defence Forces put on standby. Businesses have been urged to consider whether opening would pose a risk to employees. Schools were also advised to close in Northern Ireland while many college classes were also scrapped. The Lord Chief Justice advised the judiciary to cease all court hearings at 12.30pm. All government buildings providing non-essential services were closed at 1pm and all non-essential civil service staff were sent home. Belfast International Airport said the storm is having an impact, with both Ryanair and easyJet cancelling flights. The airport is expecting more cancellations. Anyone due to travel has been advised to contact their airline. 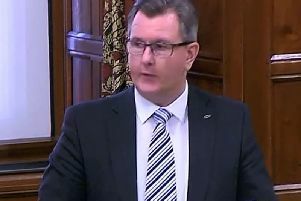 David Sterling, head of the Northern Ireland Civil Service, admitted that safety advice and information could have been provided more quickly to the public in the region. There was anger among teachers and parents that the Department of Education did not advise about school closures until late on Sunday night. Speaking at Stormont prior to an emergency meeting with the permanent secretaries from all Government departments, Mr Sterling said: "Perhaps in hindsight we may have done some things more quickly. "But now we have given clear evidence and advice out to the community and we will continue to do that." Met Eireann issued a status red weather warning across all of the Irish Republic. It has described the storm as the most powerful to have ever been this far east in the Atlantic on record. Forecasters warned of a potential threat to life and advised the public to stay off the roads and away from the coast. Counties Galway, Mayo, Sligo and Donegal are due to bear the brunt of the winds. The Met Office issued an amber weather warning for Northern Ireland and warned of "potential danger to life". The differing severity of alerts north and south of the border is more due to differences in the way Met Eireann and the Met Office rate threats, rather than an indication that Northern Ireland will not be hit as hard. In regard to Northern Ireland, the Met Office said: "There is a good chance that power cuts may occur, with the potential to affect other services, such as mobile phone coverage. "Flying debris is likely, such as tiles blown from roofs, as well as large waves around coastal districts with beach material being thrown on to coastal roads, sea fronts and properties. "This leads to the potential for injuries and danger to life." It will hit exactly 30 years after the Great Storm of 1987 killed 18 people. Northern Ireland Electricity has reported "widespread damage" to the network. Currently, 1,300 customers are without power in the region. In the Republic of Ireland all schools and colleges are to remain closed on Tuesday, the government has announced. Education Minister Richard Bruton tweeted: "Following careful consideration by the National Emergency Coordination Group, the Department of Education and Skills has decided that all schools will remain closed tomorrow." Following advice from the Met Office, Northern Ireland's Education Authority has said that schools across the region will remain closed on Tuesday. Derek Baker, Permanent Secretary of the Department, said: "I fully appreciate this decision will impact on the work of the schools and indeed on other businesses and services but the decision has been taken to avoid any potential risk to life for children and young people as well as staff." As the storm moved towards Northern Ireland the Peace Bridge in Londonderry was closed as a precautionary measure. At 3pm workers from the Department for Infrastructure sealed off the footbridge with tape and sandbags. Derry & Strabane Council also announced that from the same time, all council facilities would cease to operate for the day including leisure centres, parks and open spaces in the area. Many businesses in Derry city centre were closed throughout the day, following advice from authorities that people should stay at home and avoid any unnecessary journeys in anticipation of Ophelia's arrival. In Dublin, as strong winds swept in, roads were quiet, clear of the usual weekday traffic, as many shops and businesses remained shut amid storm warnings. Some people though braved the weather, including dog walkers and others trying to capture the extreme conditions on their phones in Clontarf. Locals took a walk in nearby Howth harbour watching the crashing waves, often struggling to keep their footing in the strong gusts.